‘We are Gorkhas Proud to be Indian’, the logo wearing Tshirt was seen running at 20th Nov Delhi Half Marathon. 5 Gorkha Runners under the Banner of Team “ Run with Roshni” participated as a team for the First time and came with Flying Colour also. Uttam Bhujel a student of SUMI studying in class 12 who will be appearing for his HS exam has clicked a timing of 1.14.41 bringing him 2nd in the category of 18-25 yr amateur overall 6th among 7726 runner. Meanwhile Binod Tamang in the same category came 8th among 356 runners and overall 17th among 7756 , while Ranjit Rai again in the same category came 11th among 356 runner and overall 21st among 7726 runners. Binod Tamang and Uttam Bhujel studies in SUM Institution. The Teacher In charge of the school Rev Dr Jagat Rai today speaking with reporters here said that the School is feeling very proud with the two performances. Kamal Thapa in 45-50 age categories came in 5th Position among 855 runners. While the Team Leader Roshni Rai , nickname Pedong express to finished the 21 kms half marathon . All five runners met Darjeeling MP S S Ahluwaliya who arranged the accommodation of all five after the race where fortunately GTA Chief Bimal Gurung and GJMM party Secretary Roshan Giri was also present. Later The MP talk with the Sports Minister Vijay Geol in all presence and requested that they be considered for the National Academy of Athletics.The sports minister, in turn informed Mr. Ahluwalia and all athletes, that they would be given a fair chance to perform, and that if they met the criteria, they would be selected for NAA. Athletes from team Run With Roshni are not only hopeful, but they are confident that they will make the cut. Roshni Rai said “Gorkhas have made the Slogan 'Jai Maha kali aayo Gorkhali' famous from different battle fields now team Team RunWithRoshni will make the slogan ‘We are Gorkhas Proud to be Indian’ famous from the different Marathons along with the performance also. 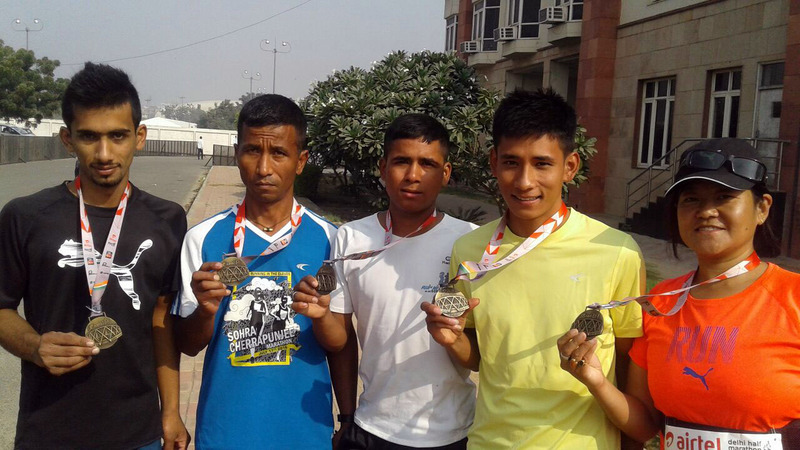 0 Respones to "Gorkha runners shine in Delhi Marathon"